Live from the casino expansion debate: Development Permit Board gives Paragon and PavCo. what they want, while acknowledging the risk posed to Vancouverites by gambling. On December 16, 2013, the Vancouver Development Permit Board debated Paragon Holdings' and PavCo's bid to stitch a luxury resort-casino complex to the side of BC Place. The Edgewater Casino has already been approved to move from its current False Creek location; at issue is how big the new incarnation of the casino can be. 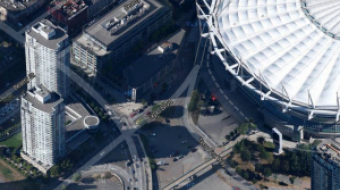 While the applicants argue that BC Place will not be home to an expanded casino, the actual plans do leave the door open for expansion; either at the outset or further down the road. Vancouver Not Vegas and its supporters were in attendance, having opposed the casino project since its inception. The group argues that the BC Place development plan is not, in its current state, ready for prime time. We will see how a potentially-expanded casino in the city centre is supposed to fit into Vancouver's Healthy City Strategy. That relationship is a bit of a paradox at the moment: in Lower the Stakes: A Public Health Approach to Gambling in British Columbia, Provincial Health Officer Dr. Perry Kendall 's report calls the BC Government's willingness to expand gambling spaces "counterproductive", concluding that "The available evidence suggests that this expansion of gaming availability has resulted in increased prevalence of problem gambling in BC." In front of a tense crowd, the Permit Board heard from the applicants and City advisors; as well as from individual Vancouverites, none of whom spoke in favour of the casino project. Ultimately, the Permit Board allowed Paragon's and PavCo's permit to proceed, effectively green-lighting the project; albeit with a few amendments. The biggest such amendment was requiring the applicants (through a gambling addiction expert) to provide a harm mitigation plan. The casino project goes before Council on January 27, 2014. Shortly after the vote, Mayor Gregor Robertson posted a message that read in part, "Before a relocated casino can begin construction, the proponents have to come back with a plan that addresses the health concerns raised by Dr. Perry Kendall. If they don’t, it cannot proceed. "I’m pleased to see the Development Permit Board direction to the applicant to develop a management plan that will address Dr. Kendall’s recommendations, including issues such as access to alcohol, the availability and number of ATMs at the casino, and the need for a public health strategy to minimize risk and harm." However, once that expanded floorspace becomes a reality, the Mayor's Office (and whoever happens to occupy it) may well find itself powerless to control what happens next. Vancouver Not Vegas described the amendments to the preliminary permit as a silver lining, since the Kendall Report will at least get addressed. Below is the liveblog of the proceedings. 3pm: It's a full house; they've opened the foldable wall to extend the seating area. Hang on, we're starting in a moment. Here you will find the live blog of the casino permit hearing, beginning at 3pm. Please refresh this page for the latest updates. 2:47pm: One gentleman wonders aloud what the extra casino floorspace will be used for, if not more gambling facilities. I suggest a merry-go-round, perhaps based on childhood memories of Circus Circus in Reno, Nevada. He leans in and says, "We're on the merry-go-round, buddy." 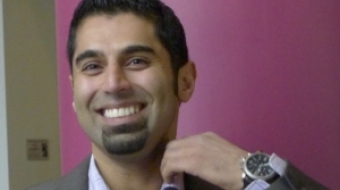 Under Raj Mutti, the Hard Rock comes to Vancouver (or at least Coquitlam) for the very first time. Citizen group Vancouver Not Vegas urges postponing until the chief medical health officer's report comes in. 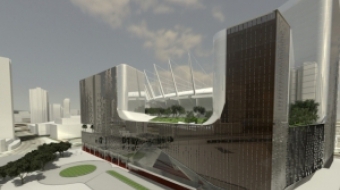 Renewed attempt to glue an expanded Edgewater Casino to the side of BC Place.